With a tradition of great writers stretching back many hundreds of years, England’s reputation as a producer of literary giants is well deserved. 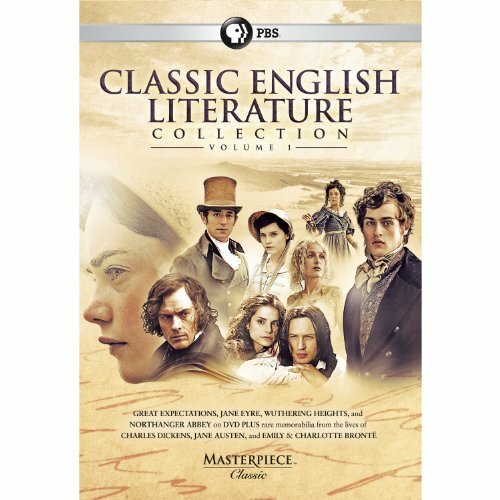 Now this incredible collection from PBS brings the lives and work of some of the greatest names in English literature to life in a new and exciting way. Great Expectations - Nothing is quite as it seems for young orphan Pip in this superb retelling of Dickens’ classic coming-of-age novel. With colorful characters played by an all-star cast (Gillian Anderson, David Suchet, Ray Winstone, Douglas Booth, and Vanessa Kirby) and conspirators, rouges, rakes and wretches at every turn, Great Expectations will have you gripped from the very first scene. (U.K. Edition) (Subtitles in English (SDH). Accompanying these films is a selection of fascinating and rare memorabilia which provides the viewer with a unique insight into the lives and works of these brilliant authors. Collated from The National Archives in London, England, this beautiful collection includes many rare reproductions, including Jane Austen’s last will and testament, census returns, tax documents, letters, illustrations, newspaper clippings, old photographs, and much more. If you have any questions about this product by Pbs (Direct), contact us by completing and submitting the form below. If you are looking for a specif part number, please include it with your message.